By comparing the LRO pictures with images collected by Apollo missions in the 1970s, they have found five craters that have appeared in the past four decades. That is helping the team to determine how frequently objects strike the Moon, says planetary geologist Alfred McEwen of the University of Arizona in Tucson. They have only surveyed a small sliver of the Moon, and expect to find more craters in the course of several more years of study. The data could fill a gap in scientists’ knowledge of contemporary collision rates for Earth as well as for the Moon, because the pair should have impact rates proportional to their size. Large asteroids that might threaten Earth can be observed in space, but smaller objects can fall undetected or disintegrate in the atmosphere [THATS AN UNDERSTATEMENT], whereas they would leave a mark on the Moon. On the far side of the Moon, a river of dark rock spills from a 3-kilometre-wide crater and divides like a forked tongue. The flow was formed when an asteroid or comet slammed into the surface and heated the rocks to more than 1,000 °C, causing molten material to spread 3 kilometres from the crater rim. “It really stands out,” says Brett Denevi, a planetary scientist at Arizona State University in Tempe. This impact scar is just one of thousands revealed in unprecedented detail by NASA’s Lunar Reconnaissance Orbiter (LRO), which has been circling the Moon since June 2009, taking photographs to map the surface with a resolution of up to 50 centimetres per pixel. Most of the fanfare surrounding the LRO has focused on the detection of water (see go.nature.com/oDK7he). But the LRO’s detailed snapshots, some of which were presented last week at the Lunar Science Forum at the NASA Ames Research Center in Moffett Field, California, are also yielding insights into the mechanics of asteroid and comet impacts and how frequently they occur — information that could improve estimates of the age of geological formations on other planets. The work, says planetary geologist Peter Schultz of Brown University in Providence, Rhode Island, “gives us another foothold into dating the Solar System”. Craters on Earth are quickly eroded, so there are few well preserved impact sites here for scientists to study. 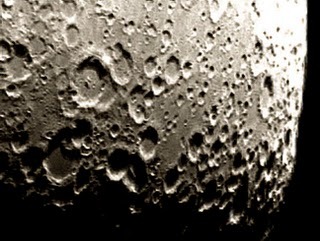 But there is little to erase a crater on the Moon except subsequent impacts, so it offers a natural laboratory for understanding how impacts excavate craters and generate pools of molten rock. Denevi and her colleagues have found that craters of similar sizes have a wide range of melt volumes — the forked flow contains an exceptionally large amount — and they are working to determine the factors, such as the speed, composition and approach angle of the impactor, that might account for this variability. Other researchers are using the data to find newly formed craters. By comparing the LRO pictures with images collected by Apollo missions in the 1970s, they have found five craters that have appeared in the past four decades. That is helping the team to determine how frequently objects strike the Moon, says planetary geologist Alfred McEwen of the University of Arizona in Tucson. They have only surveyed a small sliver of the Moon, and expect to find more craters in the course of several more years of study. The data could fill a gap in scientists’ knowledge of contemporary collision rates for Earth as well as for the Moon, because the pair should have impact rates proportional to their size. Large asteroids that might threaten Earth can be observed in space, but smaller objects can fall undetected or disintegrate in the atmosphere, whereas they would leave a mark on the Moon. The crater count could also lead to a re calibration of methods for estimating the age of surfaces elsewhere in the Solar System. Right now, the Moon acts as a sort of fundamental clock. Scientists have dated lunar samples returned to Earth by Apollo and linked those dates to the crater density of the sample’s original terrain. So when a surface with a certain crater density is found on Mars, for example, researchers compare it with surfaces on the Moon to pin down its age. However, corrections must be applied, owing to differences in impact rates between the Moon and Mars. These are estimated from asteroid orbit calculations, Mars’s location in the Solar System and models that account for its greater size and gravity. By combining LRO observations with those from other spacecraft, scientists may be able to determine relative impact rates throughout the Solar System more directly. McEwen and his team have been finding new craters on Mars for the past four years, using data from NASA’s Mars Reconnaissance Orbiter. And a current impact rate for Mercury may emerge when NASA’s MESSENGERmission begins to orbit the planet next year, although McEwen says that new craters would have to be very large to be detected. Schultz says that this is an opportunity to improve the dating of surfaces on other planets with measurements rather than models. “You want to see what nature shows you,” he says.